3D printers used to be an expensive item you would only find in medium size or larger businesses. Recently dropping prices have made it possible for hobbyists like Jay Leno to have 3D printers in their garage or workshop. But the most unexpected place they are appearing is in support of the war effort in Afghanistan. The U.S. Army looked at the time and effort required to discover a need on the battlefield, report it, develop and test solutions back home and ship it back to the battlefield and realized it was unacceptable. Their solution: The Rapid Equipping Force (REF). The REF is not new. It has been rapidly supplying soldiers with new and improved technologies for a decade. But even equipment from the REF could take months to make it to the field. Much of the equipment supplied by the REF was originally thought of by soldiers. The REF might not hear about an idea until a soldier came home and reported it. Once reported it could be worked on by the REF engineers. Then when an idea became reality it could take several more months before equipment made it to the field after required prototyping and testing. 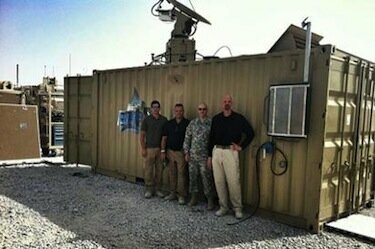 The Army’s answer to this frustrating problem is the “Expeditionary Lab – Mobile.” It is a small design and manufacturing lab fit into a shipping container. The lab is filled with equipment to make designing and prototyping solutions as quick and easy as possible. It can move to where it’s needed either by truck or by airlift. Once on location it is manned by two engineers. They are backed up by a Rapid Prototyping 3D printer capable of printing parts out of plastic and a Computer Numerical Control (CNC) Machine that works with metals. All the tools found in a well equipped machine shop are also included. If a problem stumps the on-site engineers they can link via satellite to scientists and engineers at REF in the US. Both groups of engineers can have real-time collaboration with a combat soldier. The soldier can have an active part in designing the equipment that makes his life easier. Equipment that might increase his chances of survival. When a solution is found the lab can use the 3D printer or CNC to produce some units immediately it can be mass-produced elsewhere. If only a few units are needed the lab can produce them all. Of all the devices in the Expeditionary Lab – Mobile there are two that it absolutely has to have – the 3D printer and the CNC machine. The 3D printer is probably the most necessary of those two. It can print any part that does not need metal. It can even print a working gun. Unlike the CNC the 3D printer doesn’t waste any material. The printing is an additive process, meaning it adds the material necessary to print the object. Machines like the CNC drill, shave, or cut excess material away in a subtractive process. The extra material is either disposed of or recycled, if possible. 3D printing also saves time. Building a design using more conventional methods can take days to create the designs, fabricate and join the parts and test them. 3D printing can produce a model in a few hours. Once the effectiveness of the design is confirmed more copies can be printed out to supply soldiers until it can be mass-produced if mass production is desired. Any army has to make wise use of its resources. By leveraging old technologies, new technologies and the experience of front line combat troops the Expeditionary Lab – Mobile saves time, material and ultimately lives.